﻿ Fun Easy English - reading practice and learning about the holiday Hanukkah. 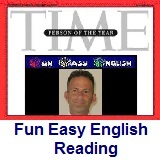 This is a reading comprehension lesson to test your ability to understand information written in English. Read the information below and then answer the 10 test questions. Hanukkah is an eight-day Jewish holiday. It traditionally celebrates the victory of the Maccabees over the larger Seleucid army. It also celebrates a miracle that happened during this time, wherein just a days supply of olive oil allowed the menorah in the rededicated Temple in Jerusalem to remain lit for eight days. Therefore, Jewish people celebrate Hanukkah for eight days. Hanukkah begins on the 25th day of Kislev according to the Hebrew calendar. Hanukkah begins in late November or December. The Hebrew word hanukkah means dedication. The hanukiah (or hanukkah menorah) is an important Hanukkah candle holder. It has nine candles. Traditionally, one candle is separated from the rest, usually by being higher than the other eight. On the first night, only one candle is lit, on the right side of the hanukiah. On the second night, a second candle is added to the right side, and then they are lit from left to right. This continues for all eight nights. The candles are never lit directly - instead, the higher candle, (called a shamash, meaning "attendant") is lit first, and then used to light the rest of the candles. Before the candles are lit, blessings are said over them. Jewish children often play a game called dreidel. During the 2nd century BC, the Seleucid Empire forced Greek culture on the Jewish people and forbade Jewish religious practices. The Maccabees revolted and liberated Jerusalem. The Maccabees found the Temple defiled. They sought to rededicate it to the Jewish God, and they needed to relight the menorah, which fed on sacred olive oil. According to the Talmud, the Jewish people only found a single container of undefiled oil, and that oil was only enough to last a single day. The Jewish people took a leap of faith and relit the menorah. To their surprise, the menorah stayed lit for eight days, which was seven more days than they expected. The Jewish people attributed the surprising amount of time that the oil lasted to God (a miracle). Hanukkah is an eight-day celebration, and each day commemorates each day that the oil lasted. On each day, a branch of the nine-branch Hanukkah menorah is lit with the shamash ("helper" candle), which sits on the ninth branch. Hanukkah is a wonderful holiday and the menorah with eight candles on the last night of the holiday is really beautiful. This is a nice holiday for Jewish families, and of course for the kids, who get a present for each of the eight nights. 1. Hanukkah is a Jewish holiday with how many days? 2. Hanukkah traditionally celebrates the victory of which group over the larger Seleucid army? 3. What type of oil allowed the menorah to stay lit for eight days? 4. Hanukkah begins on which day according to the Hebrew calendar? 5. What is the English meaning of the word Hanukkah? 6. What is a menorah? 7. What is the Hebrew word for attendant? 8. Jewish children often play which game on Hanukkah. 9. When did the Maccabees revolt and liberate Jerusalem? 10. What does each day of Hanukkah commemorate?